Virtual technology will show let kids experience how cool it is to farm. The South Dakota Corn Utilization Council is taking corn promotion on the road. 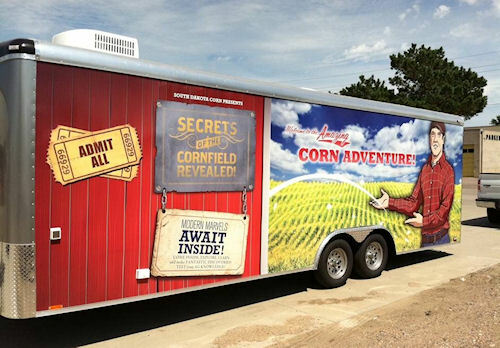 It's built an interactive farming experience into a 24 foot long trailer called the "Amazing Corn Adventure." The trailer was on display at the South Dakota State Fair September and will be going to schools in the state in the fall. "This will be a huge learning opportunity for kids who aren't on the farm," says Teddi Mueller, legislative and industry affairs director for the Corn Growers Association and Corn Utilization Council. "This trailer will allow us to bring ag to places that ag would never be seen." Participants will enter the trailer and proceed through a presentation that stresses the importance of soil and shows them all stages of corn. The activities will have them laughing and learning at the same time. Kids will learn the difference between sweet corn and field corn, and play a matching game that educates them about products that contain corn. A feature that's a real favorite is an interactive cab. Kids sit in an actual tractor cab and feel like they are driving the tractor. A video screen will provide a sense that they're planting corn in a South Dakota field. All of the levers have interactive buttons so the kids can push one and a farmer will tell them what role that lever plays in the operation of the big rig. SDCUC will take the trailer to area schools beginning this fall. At a time when school district budgets and resources are being cut, the trailer will be one more tool that can be offered to students on site, at no cost to schools. Mueller said South Dakota Corn is boosting its emphasis on agriculture education for children and this is just the first big step. "This will be a stepping stone to bigger opportunities looking ahead," she says.